The new school term is well and truly under way, and you’re beginning to settle into your new routine. And if you’re anything like us, that means you have precious hours every day to devote to work. And what better to inspire creativity and industry than fun and stylish work supplies? Imaginative and witty stationery is no longer just for kids – grown ups can get into the act too. 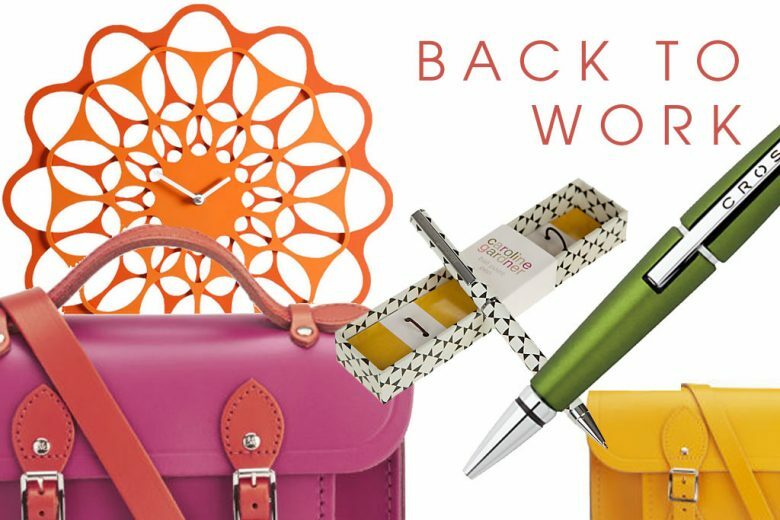 So to help put some colour and fun into your work day, we’ve picked our favourite autumn-inspired back-to-work office accessories. Keep an eye on the time with this deliciously delicate wall clock with geometric design by Diamantini & Domeniconi. Stay sharp – keep your pencils in shape with this quirky squirrel sharpener. Make sure your books in order in either this mini two tone satchel or a bright monochromatic hue like this yellow bag from the Cambridge Satchel Company. Write in style with this pretty Ballpoint Pen or alternatively with a fat Cross pen – complete with free engraving, lest the small people try and steal it. Big ideas will find a special place in these personalised leather notebooks. Create a practical workspace in the tiniest corner of your home. How to breathe life into an uninspiring corner workspace. How to stop your family taking over your home workspace.